Πατήστε τη φωτογραφία και δείτε όλες τις φωτογραφίες του Maple at Night Inn. 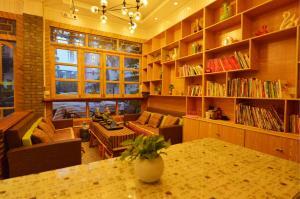 Featuring free WiFi, Maple at Night Inn is located in Yangshuo. Among the various facilities of this property are a terrace, a shared lounge and a bar. The accommodation offers a shared kitchen, room service and buying tickets for guests. At the guest house, all rooms have a balcony. All rooms come with a private bathroom with a shower and free toiletries. At Maple at Night Inn rooms are equipped with air conditioning and a flat-screen TV. A variety of popular activities are available in the area around the property, including cycling and hiking. Yangshuo South Bus Station is 200 metres from the accommodation. Guilin Liangjiang International Airport is 92 km away.